Windows live writer one of the best desktop blogging tool makes your blogging live lot more easier. But when you are moving your Windows live writer from one computer to another you have to move the settings as well else you end up configuring everything again. 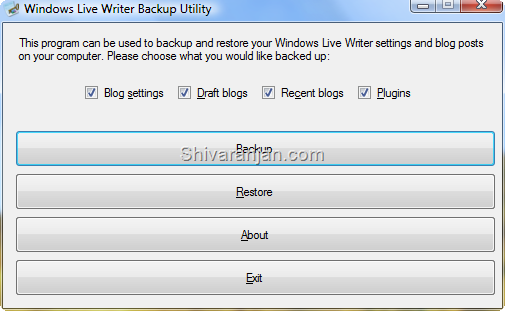 Scott Lovegrove has created free tool that takes care of this by backing up your Windows live writers settings. Using this tool you can easily restore these settings without any effort. Scott suggests: If you’re running this on Vista and you have UAC turned on, you will need to run this as administrator, or you will be asked to accept/deny. Well I did not have any problems as I had turned off my UAC, but if you have UAC turned ON then better run as suggested by Scott. 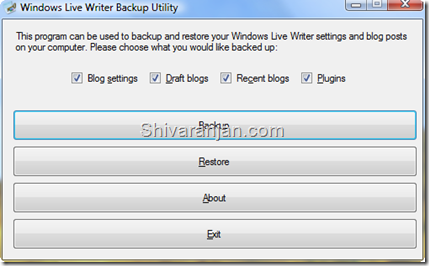 Scott also has written a post that tells you how to schedule Windows live writer backups.